the neuro trend is likely to continue for the foreseeable future, like a chattering neuron. Se we might as well sit back and enjoy the show, right? In order to make sense of the plots and intrigues in the palace of brain sciences, it is worth contemplating the sheer diversity of traditions that take up residence within its walls. And the paint isn’t even dry on these walls — until very recently, there were almost no undergraduate programs in neuroscience. I entered the field a little over seven years ago. Prior to that I studied physics, and I was only dimly aware of the umbrella term “neuroscience”. Before discovering neural networks I assumed only medical doctors studied the brain. When I entered grad school one of our professors — also a former physics type — began his course on computational neuroscience with a little “sociology” of the field. He illustrated his description of the fields feeding into neuroscience with a handy little scheme. 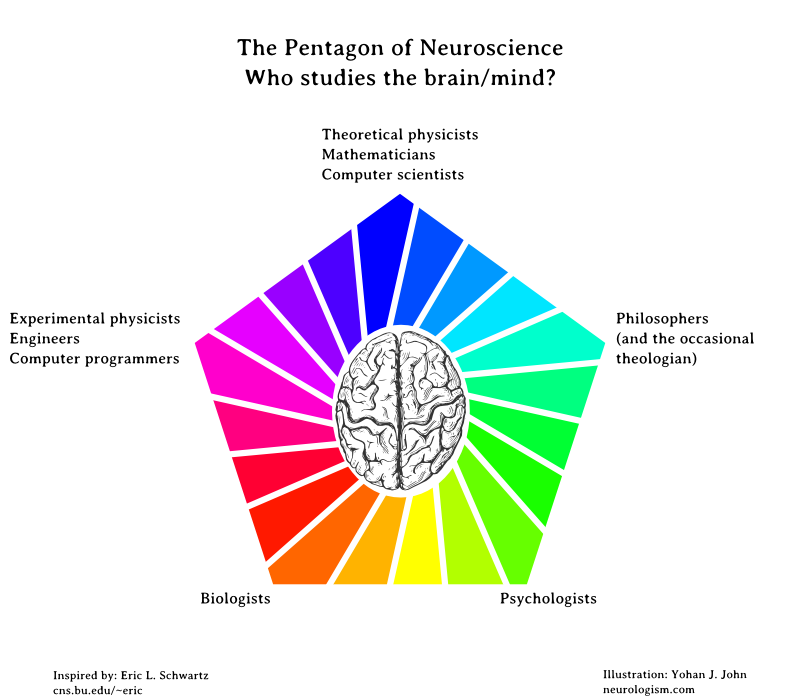 And here it is for the wider world to enjoy: I give you the Pentagon of Neuroscience. It’s only half-serious — it is not a systematic characterization of the field, but it can help us to locate and contextualize the neuroscientists, the types of questions they ask, and the methods they use. Until a few years ago, neuroscience culled most of its practitioners from a variety of other departments. In my department we all saw ourselves as misfits and outcasts from our respective fields — united in our interest in mind and brain, but divided in pretty much every other respect! Yet the clash of cultures that occurs when a biologist talks to a former physicist is the kind of friction that, on a good day, leads to creative sparks. (On a bad day, however, it will lead to much fuming.) With the professionalization of neuroscience and the proliferation of undergraduate programs, I hope this multicultural society does not fall between the cracks of academic fragmentation and specialization. Tunnel vision is unlikely to help us paint an integrated picture of mind, brain and behavior. 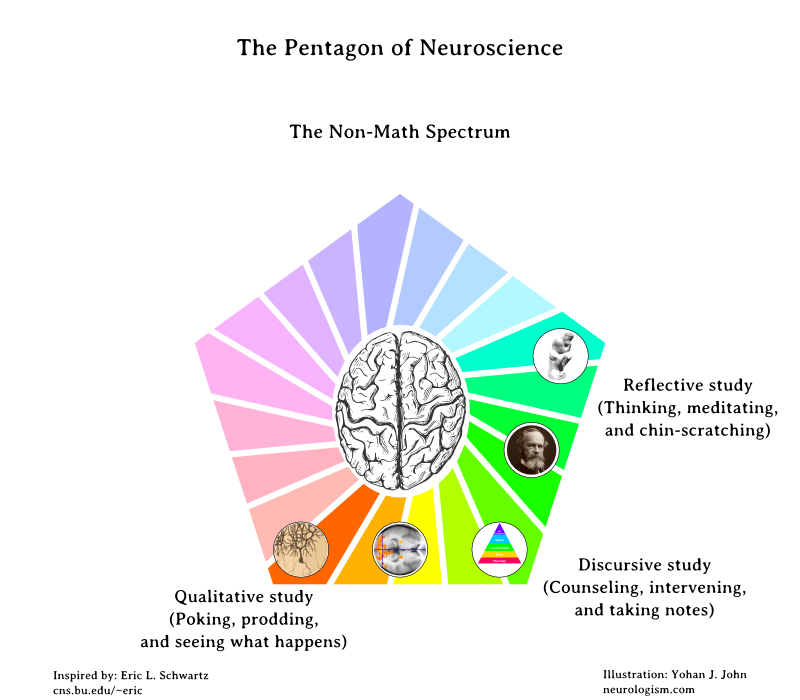 The Pentagon of Neuroscience — or Neuragon for short — is a cyclic spectrum diagram, like a color wheel or a musical octave. The cyclic structure means that adjacent points share some similarity along some dimension, and as you move clockwise or counter-clockwise that dimension gradually changes. Let’s start with the theoretical physicists, mathematicians and computer scientists at the top of the Neuragon. As you move counterclockwise from there, the use of abstract mathematics decreases and the use of computational or numerical mathematics increases, until you reach the biologists. Biologists, in my experience, are not especially comfortable talking about differential equations. But they do need statistics these days. As you move away from the biologists and towards the psychologists and philosophers, the relevance of mathematics vanishes completely. On the upswing of the counterclockwise cycle, the use of verbal methods increases. (My professor somewhat uncharitably referred to the philosophy/theology corner as the “verbal fringe”.) From the practically-minded verbal techniques of counseling psychologists we move up to the most abstract philosophers of mind. Methodologically and temperamentally, analytical philosophers have much in common with mathematicians and computer science. They like to define terms clearly and then allow rigorous logic to do the heavy lifting. The clockwise movement can be described more simply with a thought experiment. Imagine a mathematician engaged in reflection. She might ask how her mathematical ideas arise in the first place. From here she investigates the philosophy of mind, which describes thought processes abstractly, without reference to neural substrates. Seeking more concrete understanding, she flips through a psychology textbook, which points her in the direction of the brain. Diving into the ocean of neuroscientific facts, she is dismayed by the buzzing confusion of biology and neurochemistry. A far cry from crisp black mathematical symbols on white paper. Seeking to simplify by stepping back and taking a wider, fuzzier view, she seeks solace in computational neuroscience — neurally inspired but simplified models that serve as toy analogies to neural processes. A short hop from mathematical modeling takes her back where she started, contemplating the mysterious connections between mathematical forms and nature. For simplicity (and for kicks) lets simplify the vertices of the Neuragon, labeling them with Greek letters that connote the fields they denote. Neuro-alpha (νρα): This is the abstract, symbolic, whiteboard/pen-and-paper world occupied by mathematicians, theoretical physicists, and computer scientists. Alpha is the first letter of the Greek alphabet, and connotes beginnings, and therefore the clean slate world inhabited by many mathematicians — a world of both invention and discovery. Alpha is related to aleph too — a symbol with a powerful pedigree in mathematics. Alpha-neuroscientists attempt to invent new mathematical and algorithmic techniques to imitate human and animal intelligence.They are not typically interested in alleviating the pain of neurological disorders, and rarely enjoy the mushy world of actual brains. Their scientific orientation is often that of a puzzle-solver. The twist is that these theoreticians invent the puzzles that they then attempt to solve, and can never be sure if all the puzzle pieces will ever fit together. Click to view animated gif. I simulated this in Matlab. It’s a neural network that works like a reaction-diffusion system. More gifs like this here. Neuro-chi (νρχ): This is what most people imagine when you tell them you’re studying the brain. White coats, test-tubes, gooey bits of brain, microscopes, electrodes, lab rats… the stuff that keeps science grounded and hands-on. Chi is a letter I associate with the hypothesis-testing side of experimental science, because of the Chi-squared distribution. Also, capital chi is X, which is sometimes used to stand for eXperimental (e.g). The X-Neuroscientists are studying actual brains of animals and humans. Some of them are aiming to help treat diseases and disorders, while others are satisfying their curiosity about brains. 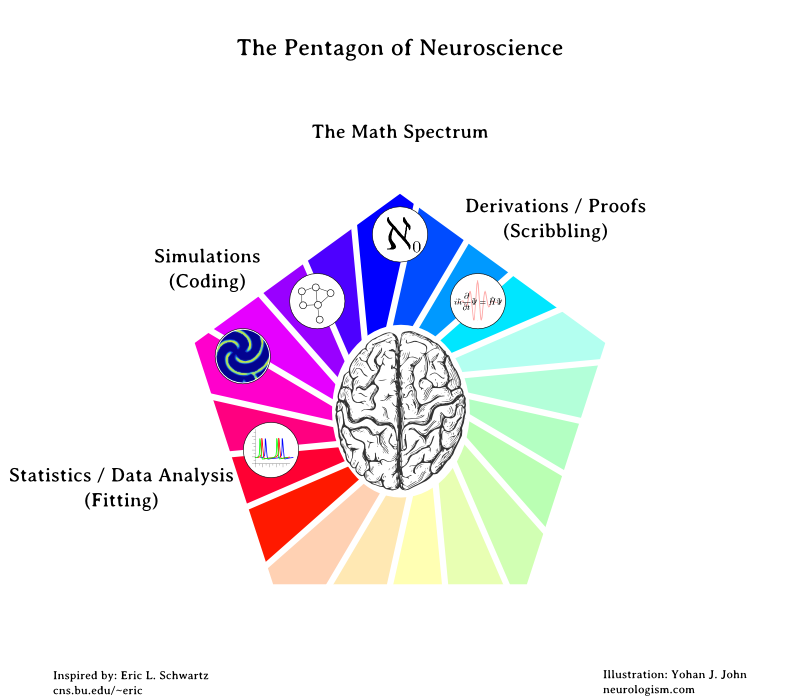 They might take some interest in mathematics as a tool, and in psychology or philosophy as overarching schemes, but in my experience they prefer the task of seeing for themselves how the nervous system looks and behaves. 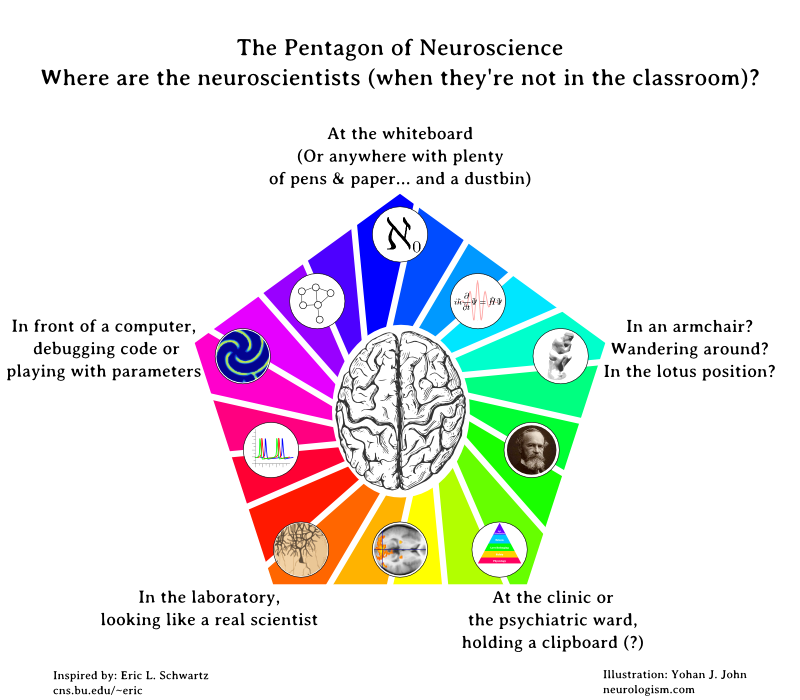 Neuro-psi (νρψ): Neuropsychologists probably have this on tee shirts by now! 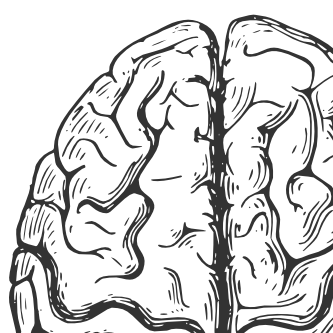 You could say that medicine and psychology are the grandmother and mother of neuroscience, respectively. It was the psychologists who brought together people from other fields, piquing their interest in the link between mind, brain and body. I think psychologists and psychiatrists are typically more interested in humans than animals, and are interested in brain facts only if they help with their understanding on higher-level mental phenomena. The kind of social neuroscience that receives the most bouquets and brickbats tend to emanate from the psi-zone. Neurologists and neurosurgeons might fit somewhere in this neighborhood — perhaps between chi and psi, but interestingly enough, I rarely meet medical doctors — their culture seems a bit removed from academic neuroscience, which is unfortunate. I chose to reference to Maslow’s hierarchy of needs because it is a well-known psychological systematization of higher-level concepts. Many neuroscientists shy away from terms like “love” or “esteem”, but those who study behavior often find it useful to think of humans and animals (and artificial systems) as having to decide between several goals — food, security, pain avoidance, etc. In doing so we have to construct our own operational hierarchies of needs, desires or drives. Neuro-phi (νρφ): The neuro-phis are the ones who are best qualified to say “fie on neurobabble”. Philosophy is often seen in the west as the mother of all disciplines, and the final arbiter of truth and cultural importance. There is a great deal of truth in this, but a careful look at the history of science reminds us that educated elites who worked with their tongues and their pens rely for much of their intellectual (and literal) fuel on people who rarely feature in the annals of Great Men: “hunter-gatherers, peasant farmers, sailors, miners, blacksmiths, folk healers“. Nevertheless, philosophy is a key repository of abstract, high-level thinking on all topics known to humanity, and philosophers are adept at keeping us neuroscientists on our toes — not so much by answering questions as by asking them. Philosophers help us maintain a healthy skepticism of trendy scientific “facts”, and show us how to argue tenaciously yet rationally. (Their children grow up to become good neuroscientists too, apparently.) In my opinion neurophilosophy can sometimes border on the absurd, but I also think scientists could learn a lot from the care with which many philosophers interpret experimental findings and probe their connections with the mind. The astute reader will have noted by now that I have not used the word “cognitive” anywhere in the infographic or in the text (except in this sentence). I will leave the task of placing cog sci on the Neuragon as an exercise for the reader. The even more astute reader will note that I have oriented the brain cartoon at the center of the Neuragon so that (1) the frontal areas of the brain face the “blue sky” thinking of mathematics and theoretical physics, (2) the left side of the brain faces the more mathematical/analytical fields, (3) the right side of the brain faces the more holistic fields, and (4) the visual areas at the back of the brain are “keeping an eye” on the red zone of experimentation. More visual puns may well reveal themselves. Images were created in Inkscape. Clipart was derived from wikipedia and from the clipart repository of the Educational Technology Clearinghouse. I must also thank my good friend Madhu M Chandran for triggering all this by bringing up the concept of an epistemological circle. That’s what reminded me of my professor’s pentagon. Posted on September 9, 2013 by Yohan. This entry was posted in humor and tagged hype cycle, neuroscience, psychology, science. Bookmark the permalink. ← Synesthesia — secret passageways in the mansion of memory? 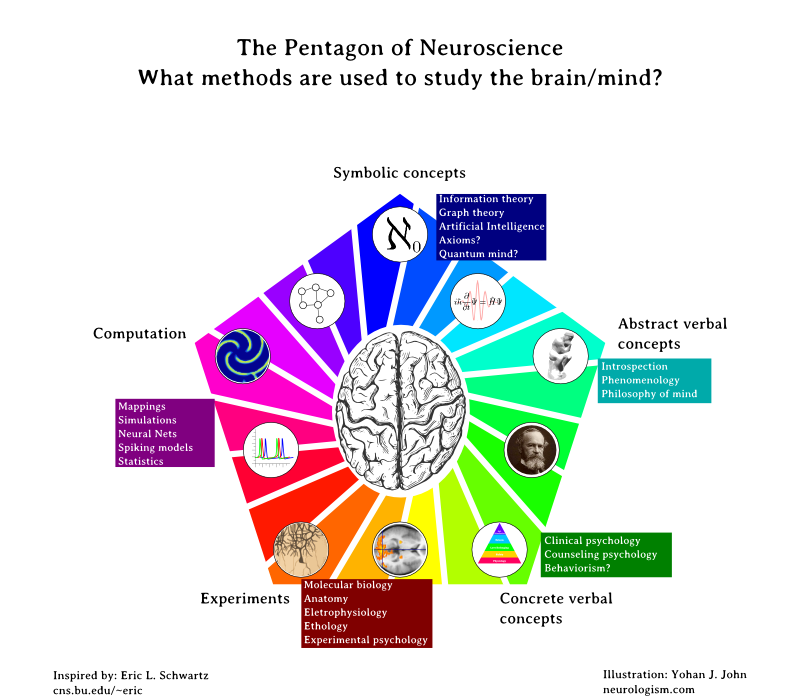 I liked the analogy so much 🙂 I think Cognitive scientists must be at upper left of the pentagon, so as to utilize the information from the Abstract verbal concepts, Concrete verbal concepts and Experiments to work on computation and symbolic concepts. Yup. I tend to think of cognitive science as being somewhere in the upper half. The math oriented people on the left, and the verbal people on the right. What I miss is a unified paradigm based on core or upper ontology. The varied domain ontologies (paradigms) used are a serious drawback of the underlying theory that does not involve the concept of operation, which means energy, as all this is about the flow of energy. Not sure I understand what you mean by “domain ontologies” or “operation”. All scientific ontologies involve matter and energy. For abstract analysis of behavior, information can be treated as a given, though this can sometimes lead to confusion, since information is a slippery concept. For philosophy, you can sometimes take experience as the base: this is what phenomenologists do. All the disciplines involved in the pentagon have their own paradigm, hence domain ontologies, in theory at least. None of them seem to be integrated in a core ontology and it is not surprising either, because what you have in that respect, SUMO, DOLCE, etc. do not have their topmost concepts properly sorted out. The concepts of matter and energy may be included in the domain ontologies, but all the terms displayed are in noun forms, but and the snag is that theoretically it is not clear how abstract objects are created as opposed to the hierarchical structure of the specific-general continuum with the contained in relation. Extended named entities take care of that age old method of classification, thus objects with reference in real life are no problem. But it is a problem for all your abstract objects that are the products of mental operation in the range of a high level programming language. In contrast, all the inquiry seem to be focusing on the identification and verification very low level machine level language that is in use at very high speed, at millions of locations and a very limited instruction set of neuron firing. The correspondence sought between that low level neural activity with the manifestation of a high level programming language manifest in verbal behavior is pointless for me, though it may be promising for the pharmaceutical industry and the defense people. A good theoretical model describing how thinking is exposed in verbal production (apart from the usual stuff of logic, psychology and linguistics) could come handy to point out the existence of mental operations (which suggest the involvement of energy) that result in the relevant verbal forms available for verification of such a hypothesis. To give you an example, abstraction, isolation, generalization, specification, formalization, interpretation, isolation, reification, substantiation, to name a few. Such operations involve three concepts, namely objects, properties and relations at the top of the core ontology with many interesting fall-out.As far as information is concerned, I would only use it as another mental operation resulting in a change leading to the transformation of whatever the operation was aimed at. Did it help? May I also add, that the present picture of the Brain projects all over the world seem to try to sort out many to many relationship, which is another name for chaos, instead of seeking one-to-one (first order logic) and many to one relations (correlation, another name for causation). This makes sense. But of course, asking for a unified ontology is putting the cart before the horse, right? Science is in a sense the reverse of ontology. We start with working definitions and gradually converge on unifications and definitions. And most definitions are eventually superseded (consider how the kilogram and metre have ‘evolved’). I totally agree! But of course, that’s what the field is trying to work towards: each sub-field in its own idiosyncratic way. Energy is a more slippery issue though: you should not ‘double-count’ it. Once you factor in the energy usage from neural activity etc, there is no way you can allocate energy to an emergent process. The emergent process just shows properties that are invisible/impossible at the lower level. The presentation/slideshow/infographics do not load. Nevertheless I was pleased to read this article. 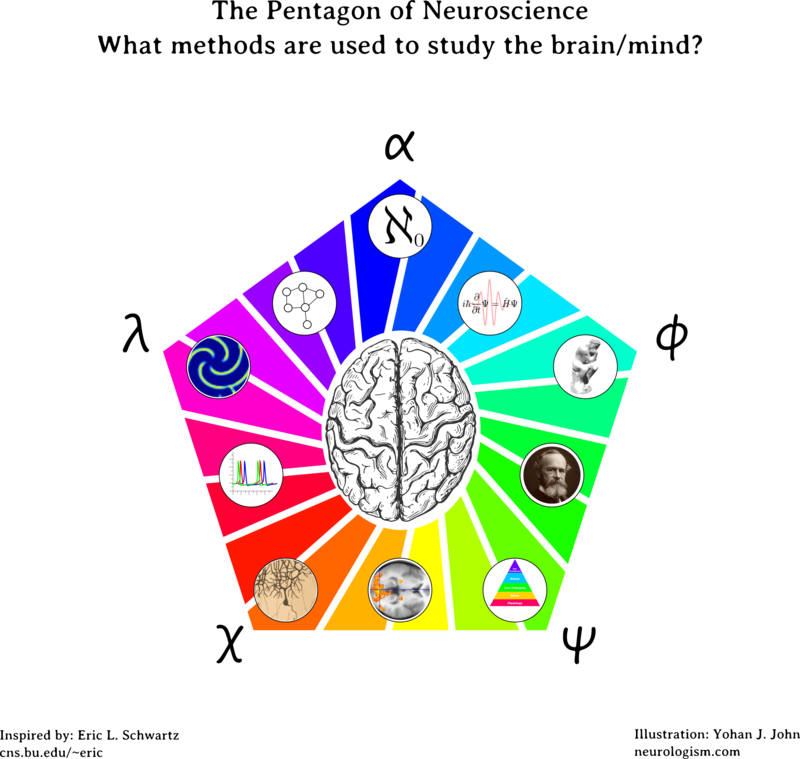 Are cognitive scientists straddling a combination of these fields? Also, how easy is it to switch between various fields, from psych to neurobiology, for instance? I drew a map of understanding much like yours. I have been working on it for a few weeks, labeling every part of it, and your labels fit PERFECTLY on the outside. Nice! Did you put it up online somewhere? What did you draw? Sadly dropbox has changed the way it hosts files, so the svg doesn’t load in the browser. Not sure what to do about it.